Manny Pacquiao has reportedly agreed to two of the key obstacles holding up his long-awaited showdown with Floyd Mayweather, Jr. First, a 60/40 split of the revenue, with Pacquiao's side taking the short end; second, a fight date on May 2, Cinco De Mayo weekend, a popular date for pay per view cards featuring Mexican fighters, and hence a way for Mayweather to thumb Pacquiao promoter Bob Arum in the eye. (Arum was looking to hold that date for his fighter Miguel Cotto to take on popular Mexican star Canelo Alvarez.) The solid gold ball is now squarely in Mayweather's gem-encrusted court. Will he finally accept the bout, or will he find another way to wriggle out of a tough challenge, as he has done many times before in his career? Cynical boxing fans who'd repeatedly promised themselves that they would never allow themselves to be suckered into rooting for this fight again are quietly burning their resolutions. The biggest fight in boxing history, at least financially speaking, suddenly looks not only possible, but likely to come about. This is dreadful news. Sorry, did I throw you for a loop there? Count me in the minority of boxing fans who would rather never see the two men meet up. And, no, it's not just because Mayweather is a terrible human being who stands to profit beyond imagination. There are many reasons we should all not only hope this fight somehow falls through, but actively root against it. They're Dinosaurs: Mayweather and Pacquiao may still be two of the top fighters in the sport, but both men are shells of what they were five years ago, when talk of a superfight began. Mayweather would be 38 on fight night. That's ancient in boxing years. And while Mayweather hasn't taken the same amount of punishment in the ring as most of his peers, his brittle hands and grueling training regime have both contributed to a noticeable decline as he's aged. Mayweather once glided around the ring like he was on ice skates. Today, he's almost stationary and when he moves, he does so with the delicate deliberation of a dog hunting for the right spot to pee. He's long since ceased throwing punches in bunches, instead relying on a single laser-like pot shot that temporarily stuns his opponent, and allows him to quickly reset the distance. If you set aside his controversial knockout of Victor Ortiz, which came as the sub-Einsteinian Ortiz looked away from Mayweather in the midst of a confused attempt to apologize, Floyd hasn't stopped an opponent since jovial Mancunian souse Ricky Hatton, way back in December of 2007. (Barack Obama hadn't yet announced that he'd be seeking the presidency, to put it in perspective.) In his most recent fights, Mayweather has hardly looked like an all-time great, twice needing to gut it out against modest contender Marcos Maidana. And Mayweather is in the better shape of the two. Whatever magic led to that string of knockouts, however, quickly vanished, and Pacquiao has not scored one in any of his 10 fights since Cotto. Even against mediocre competition like Joshua Clottey and an elderly "Sugar" Shane Mosley, Pacquiao looked flat and uninspired, nothing at all like the exploding dervish who once inspired HBO's Jim Lampley to exclaim, "Manny Pacquiao is a storm!" His body, while still taut, looks increasingly bulky, and he's visibly slowed to the point where it looks like someone has attached an anchors to each of his arms. In recent years, Pacquiao has divided his attention between boxing, acting, his role as a congressman in his native Philippines, and even a stint as a professional basketball player. In his most recent outing in the ring, Pacquiao easily defeated a guy named Chris Algieri, who still lives in his parents' basement on Long Island. It was every bit as impressive as it sounds. Heavily in debt to both American and Philippine tax authorities, Pacquiao sometimes looks like a man just going through the motions. The magic that made him the most electrifying fighter in the sport in 2008 and 2009 remains frustratingly elusive. Pacquiao will face Chris Algieri November 22nd. It Will Be A Rip Off: Just because the main event will be a thinly disguised old-timers' game, don't expect a discount on your cable bill. Mayweather has charged up to $85 for recent pay-per-views, and you can bet there will be a hefty premium for this one. Are you ready to pay $100 for three hours of lousy showcase fights for the pseudo-prospects signed to Mayweather's promotional company, followed by a main event featuring two guys who need bifocals to see their best days in the rear-view mirror? Mayweather Really is a Terrible Person: It's not the only reason to avoid the fight, but it's still a good one. No matter who you are, you need and deserve your money more than Floyd Mayweather does. Spend that $100 on something useful, like a smartwatch, something from Kinja Deals, or maybe a single bottle of Bud Light in the sort of nightclubs that Floyd frequents. Boxing Doesn't Need This Fight: Don't believe the hype. Boxing doesn't need this fight to survive. This fight is what's killing the sport! The problem with boxing is not a dearth of talent, it's not a lack of interest, and it's not that the sport has lost its appeal. The problem, epitomized by Mayweather and Pacquiao, is that in the absence of any sort of central regulatory body, the few elite fighters and promoters have organized themselves into a small number of cartels, which effectively refuse to do business with one another. For the last five years, fighters signed to the two largest promotional camps have almost never fought one another, even when it was the best fight that could be made, because of personal differences between the promoters and managers involved. Imagine if Ohio State and Oregon had refused to play each other and instead played hand-selected opponents from within their own conferences— that's what happens in boxing every day. And no two men are more to blame for this than Pacquiao's promoter, Bob Arum, and Mayweather's shadowy manager, Al Haymon. Don't reward them if they finally agree to give us what we want after repeatedly refusing the largest payday in history. Make them fix the broken system in a way that ensures we'll see more competitive fights and fewer in-house showcases. It Probably Wouldn't Be a Good Fight: Floyd Mayweather is a terrible person. He is greatly diminished as a boxer. But, yeah, he's still probably the best fighter on the planet, and he would blow Pacquiao out if they ever meet in the ring. It's just science. Mayweather has an unnatural reach—the only opponent who ever matched Mayweather for arm length was Oscar De La Hoya, who was winning the first half of the fight before a shoulder injury cost him his jab—which he uses, brilliantly to hold his opponents at bay. Mayweather sets up at a distance just beyond on his own reach, waits for his opponent to come in, and then—pop!—lands milliseconds before the foe is close enough to reach him. There's nothing like a quick clean shot to the nose to disorient a boxer; it's the only punch that legitimately stings. It makes your eyes water, your head squeezes in at the temples, and you lose your breath, all of which involuntarily freezes you for at least a moment. And that one moment is all Mayweather needs to reset his feet and repeat the process. Against Mayweather's first 44 opponents, this has proved an insurmountable obstacle, but for Pacquiao, it might be even worse. Pacquiao sets up his attack by dipping from side to side and then diving in face-first, arms flinging wildly, sort of like Piston Honda in the old Punch-Out!! game. And just like Piston Honda, a well-timed punch to his open face as he comes in is the best defense to a Pacquiao charge. 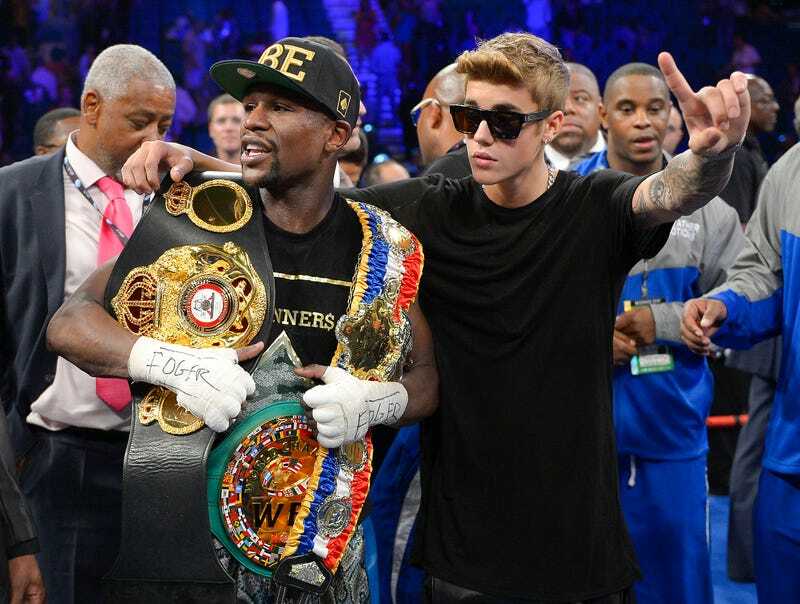 No one, perhaps ever, is better suited to time and unload that punch than is Floyd Mayweather. What does this mean? Another dull, boring Mayweather decision, another massive Mayweather payday, and another boxing fan wondering why he or she plunked down $100 to see that. I am still skeptical that this fight ever gets made; there have been too many excuses bandied about for too long. From the heavily tattooed Pacquiao developing a convenient fear of needles shortly after Mayweather insisted on Olympic style drug testing to Mayweather's irrational demands and continued unprovoked attacks on Pacquiao, both have seemingly done everything they can to prevent this fight from taking place. A few years ago, that was a tragedy for the sport. Today, let's call it a blessing in disguise. If this fight takes place, it won't be a victory for the fans. It will be a victory for two over-the-hill fighters, their wretched promoters, and at least in Pacquiao's case, their creditors. Let's hope it doesn't happen. IronMikeGallego is a longtime boxing fan and occasional contributor to Deadspin. He can be found on Twitter @ironmikegallego or at ironmikegallego@gmail.com. Photo via AP.